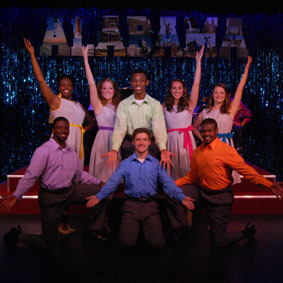 SummerTide Theatre holds its 10th anniversary performance, “Jubilee: Songs of and about Alabama,” May 31-June 28 in Gulf Shores. From the 2013 Celebrating Excellence | Theatregoers in Tuscaloosa are familiar with the quality of performances in the Allen Bales and Marian Gallaway Theatres on The University of Alabama campus, but there is one more place to see world-class musical theatre from the College’s Department of Theatre and Dance: Gulf Shores, Alabama. Each summer, the department takes a musical to the George C. Meyer Performing Arts Center. For the last 10 years the annual event, SummerTide Theatre, has established a popular presence for UA and the Department of Theatre and Dance in South Alabama. This year’s 10th anniversary production, “Jubilee–Songs of and about Alabama,” runs May 31-June 28 and includes a compilation of songs about the “Heart of Dixie” that range from blues and country to rock and gospel. Like most successful ventures, SummerTide Theatre began with a great idea. Dr. Ed Williams, professor and founding chair of the department, always wanted a program that would showcase his musical theatre students’ talent while providing them experience for professional careers. Every great idea needs a great spokesperson. For SummerTide, it is Tuscaloosa’s Bob Wright, a longtime supporter of the College. After retiring from UA in 2003 after a 35-year career, culminating as UA’s vice president of financial affairs, he took on the project. Using business contacts, he searched for financial support from the Gulf Shores community and UA supporters. A longtime vacationer to the area, Wright envisioned entertainment for all ages, but especially for people in his generation who spent summers at the beach. Williams and Bill Teague, current chair of the Department of Theatre and Dance, formed a partnership with the South Baldwin Community Theatre, which offered its venue for SummerTide. The partnership included the development of summer theatre camps for students, which pair aspiring young actors with SummerTide cast members. Each camp ends with a mini-production. Williams says the partnership is a win-win situation for all. Each summer students and faculty from the Department of Theatre and Dance return to the beach and to see many of the same promising young actors participate in the camps again. Williams said there are unique challenges in choosing a SummerTide show. They are limited to a cast of eight, which is driven by available area housing. Another challenge is to cast student actors who can perform a full run of the production – six nights a week for four weeks, which is much longer than the seven-day run of performances on campus. An important training aspect, Teague explained, is performing a show for a much longer run than on-campus productions. They also seek out students who can work well together under challenging conditions. There are the summer camps; and promotional events at places such as the U.S.S. Alabama Battleship, The Hangout and LuLu’s; and local radio and TV station appearances. They also need students who can be healthy enough to pull off six performances a week as there are no understudies. But in true theatre fashion – “the show must go on” – they have never had to cancel a performance. Many of the SummerTide cast members participate for more than one year. Having veterans in the performance is one way that the productions are such a success. Teague also sees SummerTide as a way to recruit talent back to UA. This vision is bolstered by the support of UA’s National Alumni Association. Furthermore, the department has built a loyal fan base, which routinely attends SummerTide. This year will also be a special year for Williams, who will direct his final show and retire from a distinguished 40-year career in the Department of Theatre and Dance. Wright says Williams and his musical director Raphe Crystal have become the heart of the show. For ticket information and perfomance dates and times, visit www.summertide.org.